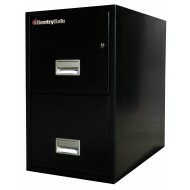 The 2T2510 is a two drawer vertical cabinet from Sentry. It is 25" deep and is designed to hold letter size documents. It has double UL protection of a fire rating (1 hour) and impact (drop test) rating. It is short enough you can use the top surface for other office equipment. 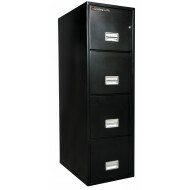 The 2G2531 two drawer vertical file set up to hold legal and letter sized documents. It comes with a UL one hour fire rating. The The 2G2531 also has an ETL a water resistance rating. It tested as water tight after exposure to one hour of sprinkler spray. 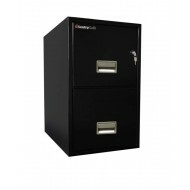 This high end file cabinet has has been tested for its strength if dropped 30 feet. It earned the UL impact rating. 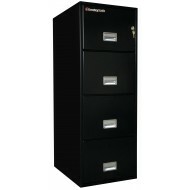 This digital media chest comes included when you order this fire rated cabinet! 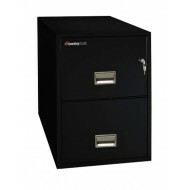 Protect hard drives, discs, tapes, memory sticks, and other digital media in this 1/2 hour fire rated case which will fit easily inside your file cabinet. 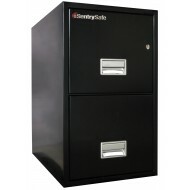 The Sentry 4G2510 is a four drawer fire rated file cabinet. 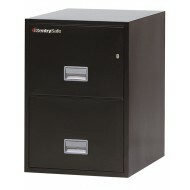 Each drawer has rugged suspension for easy movement and will accommodate both legal and letter sized documents. 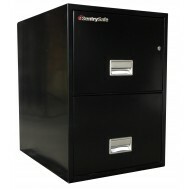 The file cabinet has also earned the UL label for impact. When dropped 30 feet the drawers did not break open.